No matter how much we language lovers might chafe at lax writing styles, the proper use of grammar carries different weight depending on the circumstances. Even the most optimistic language lovers don’t expect to see a lot of correct grammar usage when they’re reading comments on YouTube or other websites. Grammar and text messaging or emailing also don’t necessarily go well together, and that can be perfectly fine, even if it makes us cringe. In a professional setting, good grammar carries more weight. Whether it’s in business correspondence, written reports, or articles for blogs or print, improper use of grammar can, and will, damage the credibility of the writing and the writer. 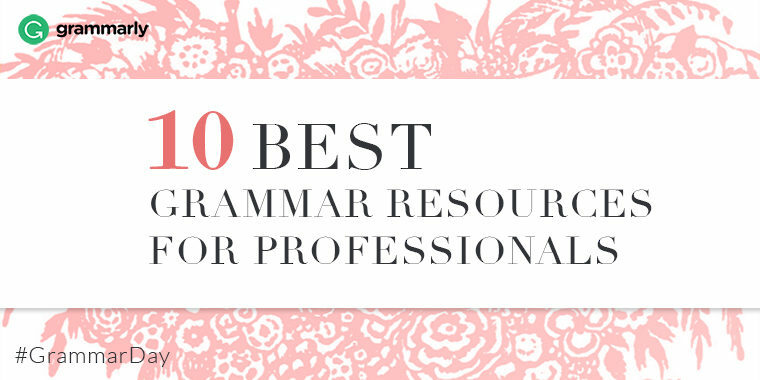 So, in the spirit of National Grammar Day, here are ten resources that anyone writing in a professional capacity can use to learn about grammar, practice it, or look up any dilemmas. HyperGrammar is an online course from the University of Ottawa Writing Center. While it might not have the structure of a classical course with lessons, it still contains all the material you would find in one. Professionals could use HyperGrammar to brush up on their English grammar, or to learn those pesky little rules they somehow always managed to miss. Grammarbook.com offers short, straight-to-the-point explanations of grammar rules with examples to back them up. It also includes notes on the informal use of English, and that makes it an excellent resource for discerning between informal and formal use.